For over a year now I’ve been applying for (and speaking) at tech conferences. Midway through 2017, I made a goal for myself to speak at at least four conferences in a year, and I’m really happy to have accomplished that goal. A lot of smart people with good advice will tell you to be selective and carefully craft a proposal for only a few conferences that are a great fit for your talk(s). That’s not how I did it. Honestly, I didn’t know enough about my talks, the audiences I was addressing, or how difficult it would be to get accepted to be picky, so I figured I would just cast a wide net to start out. First, I created a huge list of conferences, set up a notification system for myself (you can use it too), and started submitting 1-5 applications every week. The conferences I chose were mostly developer-focused, but a few were management or general technology oriented events. I came up with and pitched three different talks. One was pretty well defined as I had given it at bootcamps several times in 2016 and the other two were rough ideas without slides. I wrote blog posts for each of them (to show conference organizers that I knew the topic), and as they were accepted, I did each of the talks at local meetups to prepare. That forced me to have slides ready long before the actual event, and it allowed me to get some feedback from a friendly audience before going on the road. I also spent a lot of time practicing. By the time I gave a talk at a conference, I had typically given it in a mirror at least 20 times. I submitted at least one talk to 43 conferences, was accepted at 7 of them, I declined 2 because of scheduling conflicts, and 1 was cancelled. That means that I spoke at 4/43 conferences I applied for, a rate of just under 10%. I didn’t really have expectations for this first year, but since my approach was not very focused, a 10% speaking rate and 16% acceptance rate seems like a good start. You don’t have to be an expert in anything in particular to speak on it. Working for startups, I don’t have the luxury of being an expert in anything, and I’m sure that at some of my talks, there were people in the room who knew much more about the topic than I did. The thing is, people who are too experienced in a topic often have trouble bringing it down to a level that others can grasp within a 30 to 60 minute conference talk. Prepare and pick topics you are passionate about. You’re going to get sick of giving your talk. It’s the same thing over and over and over again for months as you prepare, so make sure you pick something that you’re very interested in and willing to focus on for months. Testing is a topic that conferences want covered, but few speakers are doing. 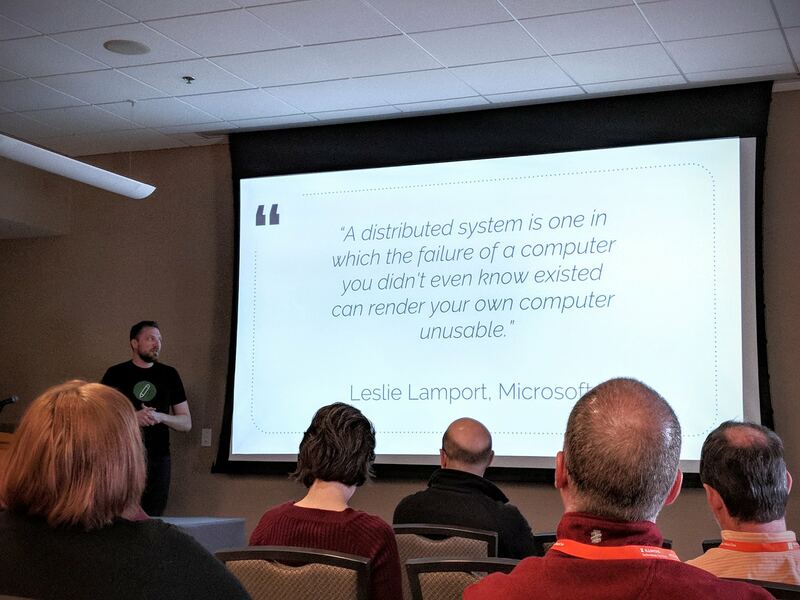 My most accepted talk was the one I’ve been doing on testing distributed systems. I never mark it as my best, but as I’ve gone to a number of conferences this year, I’ve realized that there are precious few speakers out there doing talks about software testing. If you want to get started, you might get the most success trying for something within this niche. It’s okay to turn down conferences. - Sometimes you apply for a conference and then your schedule changes. It’s okay, and organizers understand. They have to reject hundreds of applicants every year, so they can take the sting of a little rejection now and then. That said, make sure you decline offers quickly so the organizers can fill your spot with an alternate. Be ready for conferences to be canceled. This surprised me quite a bit, but three conferences I applied for (including 1 I was accepted at) were canceled. A couple were new conferences that just couldn’t get the interest needed, and one gave no explanation. So, don’t book your flights too early if they’re non-refundable! Not every speaking gig is free. While most conferences will give speakers a free ticket and hotel room, some (especially regional ones) may make you pay for your own travel. If this is going to be a problem, let the organizers know up front. I had one conference award me a grant to help pay for travel even though they typically don’t offer it. While applying to over 40 conferences in a year was a great experience, I’m going to be pickier in the 2018. I love traveling, but doing one conference per month is probably too much for me at this point, so I’m hoping to take it down to 1-3 per year and will try to focus all my talks on a single niche. If you’ve got other resources for new conference speakers, I’d love to hear about them. I’m still learning a ton about this process and trying to become a better speaker, so find me on Twitter for more.